The longest-serving dean in SAIS history, Assistant Dean for Student Life Bonnie Wilson will step down at the end of December. In the spring, she will transition to working part-time with the Office of Development and Alumni Affairs. Wilson is one of the people alumni most remember – she has been at her job for the past 18½ years, longer than any other dean in the school’s history. For most of that time, she supervised student affairs, from admissions to career services. Just as SAIS has academic standards for graduation, Wilson set social ones. I remember that in her welcoming speeches last year, she told us that we would make lifelong friendships, travel to wondrous places and drink coffee and wine with professors after class. It seemed far-fetched at the time, but it all came true. I realize in retrospect that Wilson set the rhythm of life at SAIS and maintained it through each incoming class. But Wilson’s association with the school goes back further than her administrative position. She came to SAIS as an M.A. student in 1966 and completed her first year in DC and her second in Bologna, as half of the Bologna class did then. She stayed on for her PhD, which is when she met her husband, who was also pursuing his PhD at SAIS. Washington was a turbulent place back then. Wilson recounts the race riots that broke out after MLK’s assassination, as well as the protests against the Vietnam War, for which students draped the Nitze building in blood red cloth. She worked for some time at Brookings after receiving her degree, but decided to focus on assisting in her husband’s business and caring for her children and parents after that. In the mid-nineties she returned to SAIS and worked briefly for the European Studies Program. When the Associate Dean for Student Affairs passed away suddenly, she was asked to serve as Interim Associate Dean. “I thoroughly loved the job,” she said. At the conclusion of a broad university search, she was chosen for the permanent position and Wilson has been a dean at SAIS ever since. 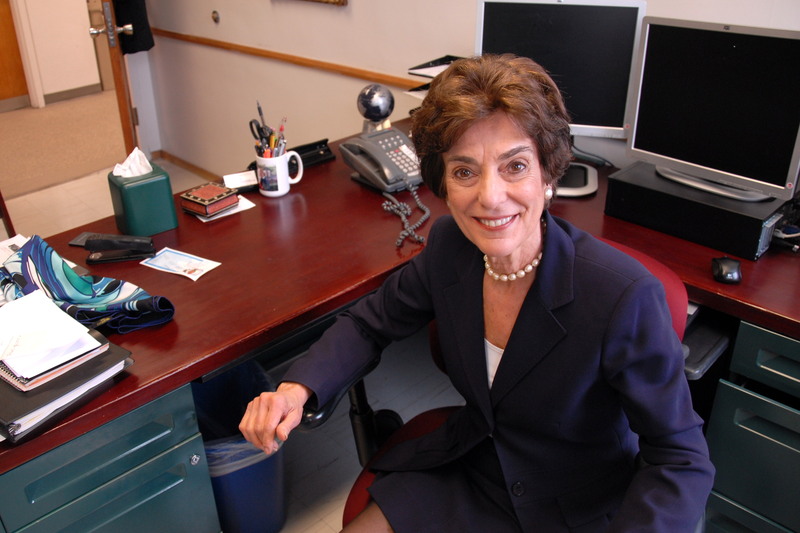 During her years of service, Wilson has seen thousands of students pass through the doors of SAIS. She read a great deal of the applications every year and was a tireless spokesperson for students within the various administrations during which she served. She welcomed students not only to DC, but she also visited the Bologna campus every year, giving energized speeches to new students. She often started working on pronouncing students’ names a month and a half before the commencement ceremony. “There’s nothing like saying that name correctly and seeing those students walk across the stage with the biggest smile on their faces,” she said. For most of her years on the job, Wilson has held a large Thanksgiving dinner for students by hosting up to 90 of them at a time in her home in Maryland. This was surely the first Thanksgiving dinner for many international students and a homey change of pace for the Americans. But there were challenging times too. Wilson said that her most difficult experience was in 2010, when Austrian student Julia Bachleitner was killed by a drunk driver in Adams Morgan. She was the one in touch with the parents and the doctors during the few days Julia lived. Wilson’s legacy lies in the emotional depth she brought to her job, a wisdom that came from her own studies here so many years ago. But that is not quite right, because in all the things SAIS students do after they leave the school, they carry a part of Dean Bonnie Wilson and her help with them.